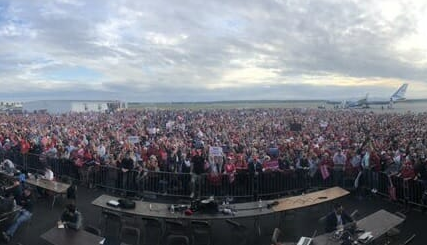 The mainstream media may refuse to give the public a complete picture, or dismiss the sheer impact, or altogether deny what is so glaring in President Donald Trump-led rallies for the midterm election: massive, massive crowds of record proportions. As usual, Trump asked the mainstream media to turn their cameras around to get a full picture and appreciation of the massive crowds. He wanted the media to show the American public that thousands of supporters have come to express their support to him and the GOP. The mainstream media, predictably, didn’t heed the request. The crowds were not “news” to them, or at least not the type of news they’d prefer to fit their narrative. Independent, smaller media groups showed the crowds as they were. The crowd that turned out for Trump’s rally at McKenzie Arena in Chattanooga, Tennessee was equally impressive. Trump's mission in Chattanooga is to support for Republican Marsha Blackburn who is in a tight race with Democrat Phil Bredesen for the US Senate. The President is also urging everyone to go out and vote. When the masses have had enough of the commies, fake newsers, antifa, clintonites, fake police, and obamunists, the masses will pummel thoses asses, hard. The size of the crowd at the Mosinee rally was 12-15k outside the venue watching from a massive tv. And we are supposed to believe no one likes him? The media doesn’t like him so they want us to think no one does. Is almost irrelevant now. So many have awoken to the propaganda & more peeps find truth everyday. Those who want truth know we cannot find it in the msm. We are also the ones who are spreading that word to wake others. Only the braindead zombies & the most brainwashed of us, still believe the two faced rhetoric that is constantly spewed from them.